In 1952, Frank Lloyd Wright completed his last Los Angeles building, the Anderton Court Shops, a small three-story group of shops on fashionable Rodeo Drive in the downtown section of Beverly Hills, California. The entrance to all the shops is off of an angular ramp which wraps around an open parallelogram as it leads upward to the shops. Four shops were envisioned with the penthouse space, an apartment. Like the Marin Civic Center, this is another example of a secular Wright building with a "steeple". The inverted “V” front elevation stands out in sharp contrast to its traditional, flat-front urban neighbors. Since the Anderton Court Center's completion, the space has been subdivided. Today the complex consists of six small shops; three on each side, each staggered a half-floor from one another and offset by the ramp. The facade, which was once light buff with oxidized-copper-color trim, has been painted white with black detailing. Today's canopy and signage are later additions, not consistent with Wright's original design. The Anderton Court Shops are on the National Register of Historic Places. ^ "National Register of Historical Places - CALIFORNIA - Los Angeles". National Park Service. Wikimedia Commons has media related to Anderton Court Shops. 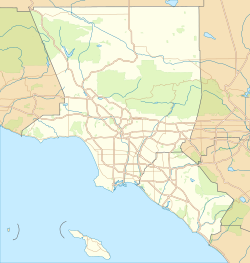 This article about a property in Los Angeles County, California on the National Register of Historic Places is a stub. You can help Wikipedia by expanding it. This page was last edited on 17 October 2018, at 10:38 (UTC).